Summary: The Mote Sea Turtle Rehabilitation Hospital has been rehabilitating Florida sea turtles since 1995. During that time we have admitted and cared for more than 350 sea turtles, representing 5 species. Historically, Mote has admitted and cared for more than 20 animals per year from all over the State of Florida. With the addition of several new tanks in our recently expanded hospital, that number has the potential increase significantly. Our exemplary track record has led to our frequently being given animals needing critical care, rather than simple maintenance (e.g., during the cold stunning event in early 2010). This project supports the purchase of a new autoclave and centrifuge, as our current equipment has received heavy use and is sufficiently old that replacement is a better option than another repair/refurbishment. We feel that Mote has historically provided excellent veterinary care to our rehabilitating sea turtles and we would like to continue this quality of care by upgrading our laboratory equipment. Since all sea turtles in Florida are threatened or endangered, providing the best veterinary care to each animal admitted to rehabilitation, and thus increasing the chances of successful reintroduction of individuals to the wild, is of great importance to the conservation of Florida’s sea turtles. 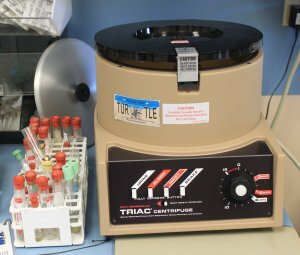 Results: Through funding from the Sea Turtle Grants program, Mote's Sea Turtle Rehabilitation Hospital was able to purchase a new autoclave and centrifuge. Both are great assets to allow Mote's continued success at rehabilitating sea turtles.